At some point this past fall or winter while talking with my grandma, she told us that when she was younger they would make Ritz cracker pie in lieu of apple pie. At first I thought she just meant they used Ritz crackers in the crust or something, but no, that's the filling! There are no apples in the Ritz cracker "apple" pie my grandma ate when she was younger. My siblings and I were all very doubtful that a pie of Ritz crackers could taste anything like an apple pie, but grandma insisted it was true. We were sure she wasn't remembering correctly or something because it sounded so unbelievable. So we told grandma that some day she should make one of each but not tell us; a blind taste test could settle this. We made it all the way to July without any Ritz/apple pies from grandma, so I really thought it wasn't going to happen before I leave the country again this fall. But the morning of my dad's birthday, before we left my grandma's house (I had slept over the night before), she started baking pie. I saw apples on the counter, and then I saw her pull out a box of Ritz crackers! She told me not to say anything when we ate dessert after lunch. She made everyone take a small slice of each, but didn't say why. Most people thought that one was sugar-free, or perhaps healthier, and my grandma wanted to see if we could tell the difference. No one suspected that one of the pies didn't have any apples in it! 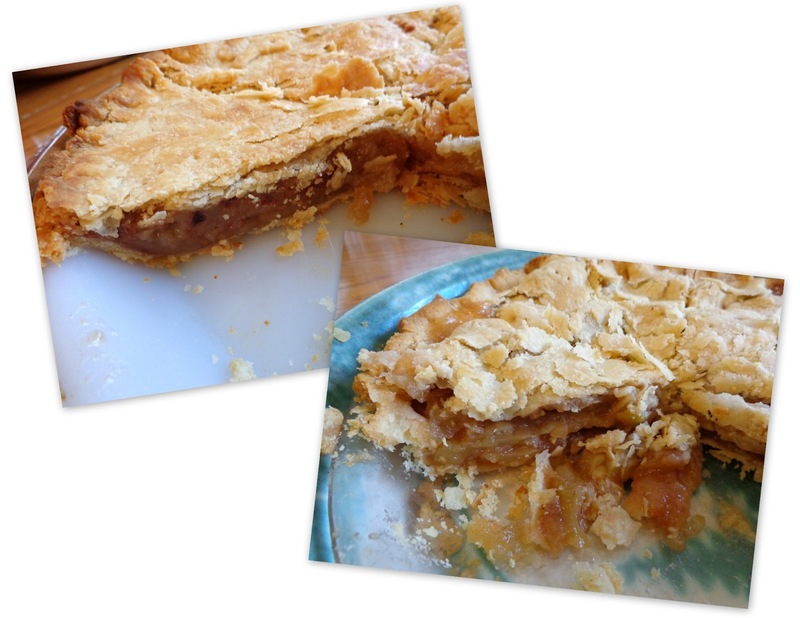 I was so surprised when I ate the Ritz cracker apple pie... because it tasted just like apple pie! Seriously. Incredible, because I had been a big doubter alongside my siblings when we first heard about the dessert. Here's a recipe and a bit of history about "mock apple pie". I'm fairly sure my grandma just used the recipe that can be found on the back of some Ritz boxes. So if anyone wants to impress their friends (or possibly win a bet), this is one way to do so. Have you heard of, made, or eaten mock apple pie before? I haven't eaten mock apple pie, but I've certainly heard of it before. Reading this post made me think of The Moves Make the Man by Bruce Brooks, a really awesome book I read as a kid. Read pages 94 and 95 about the main character learning to make mock apple in home economics. You'll probably laugh, and it's a pretty interesting take. Looks like you have to copy and paste that link, oops. You should also just read the whole book, it's not long and it's one of my favorites. A really funny, tragic and affecting book. Thanks -- I started reading it online while in Canada. I'll have to check out a hard copy from the library and finish it next week.